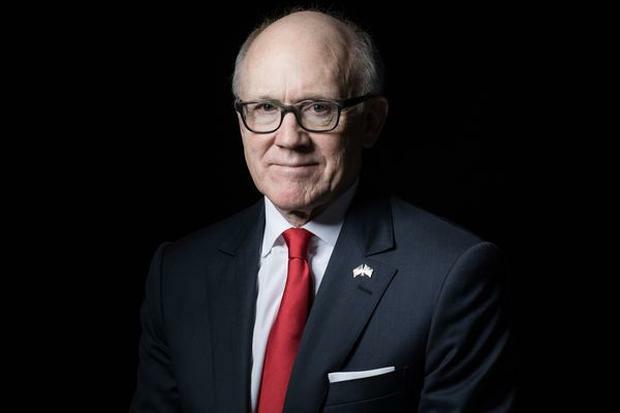 The family of Woody Johnson IV, the US ambassador to Britain, bought a pair of office buildings in London’s financial district for about Stg£300m ($393m), according to people with knowledge of the deals. The Donald Trump appointee, a billionaire heir to the Johnson & Johnson fortune, wasn’t directly involved in the 2018 acquisitions, said the people, who asked not to be identified because the deals were private. The investments were made on behalf of relatives by the Johnson family private office, which bought the buildings through New-York based investment firm Ella Valley Capital. The ambassador will not be a beneficiary of the investments, the people said. Spokesmen for the Johnson family office and the US embassy in London declined to comment. Ella Valley Capital didn’t return messages seeking comment. While US ambassadors are subject to strict rules and established norms, it’s unusual for the families of diplomats to do business where they’re posted. Conflict of interest rules can apply to assets owned or acquired by a spouse or dependent children, but not other family members, said Delaney Marsco, a lawyer at the Campaign Legal Center, a Washington non-profit organisation that advocates for restricting the influence of money in politics. But she says that the deals don’t look good. Mixing commerce and politics, though, has been a feature of the Trump administration, where the commander in chief routinely extols the qualities of the hotels and golf courses he still owns. The administration has faced numerous complaints about its ethical standards, starting with the president’s decision to transfer his assets to a trust rather than divest them. The complex holdings of some of his wealthy appointees, who were required to sell off investments that could pose a conflict, have also come under scrutiny. The federal agency charged with overseeing compliance with ethics rules has rebuked administration officials for violating them. The Office of Government Ethics was also critical of the president’s decision not to divest his holdings. Presidents of both parties regularly award some of their wealthiest campaign contributors with diplomatic appointments in prestigious cities like London. Johnson’s predecessor Matthew Barzun was the finance chairman for President Barack Obama’s 2012 re-election campaign. Johnson – with a net worth of about $4.2bn according to the Bloomberg Billionaires Index – has multiple commercial real estate investments in the US but does not hold any property directly in the UK, according to financial disclosures. He resigned as chairman and chief executive officer of the family office, the Johnson Company Inc., prior to his appointment and also handed control of the New York Jets football team to his younger brother Christopher. The London buildings, 24 King William Street and 55 Gresham Street, were both redeveloped immediately prior to being bought by the Johnson family. The larger Gresham Street building, which the family bought for about Stg£200m, is rented to Investec Asset Management Ltd., the people said. The smaller building, next door to the new London headquarters of Wells Fargo & Co. on the north side of London Bridge, is leased to multiple tenants and still has several vacant floors, according to its website.